Some Arizona legislators want to break yet another promise to Tribes by allowing out-of-state companies to accept daily Fantasy Sports bets online. While your local Fantasy Sports leagues with friends and family are perfectly legal in Arizona; expanding to for profit betting would disrupt the Tribal Gaming compacts. Even more, the bill being shopped around the Arizona Legislature risks ending over $100 million dollars in annual shared revenues from Tribal Gaming that are dedicated to education, trauma care, tourism and wildlife conservation. While THOSE REVENUES WOULD DISAPPEAR, out-of-state Fantasy Sports companies would NOT be obligated to contribute ANY revenues back to the state in return for this form of gambling in Arizona. All of this is lost in exchange for the commercial fantasy sports industry to operate here with no oversight, no safeguards for players or plan to prevent underage gambling. This is obviously a bad bet for Arizona. and tell your Legislator not to take this gamble with our Compacts, our Tribes and our Arizona way of life. Arizona has taken “a strong stance against illegal Internet gambling, which is where daily fantasy sports betting falls within this jurisdiction.” Excerpt from Mark Brnovich, Arizona Attorney General, November 20, 2015 letter to DraftKings. 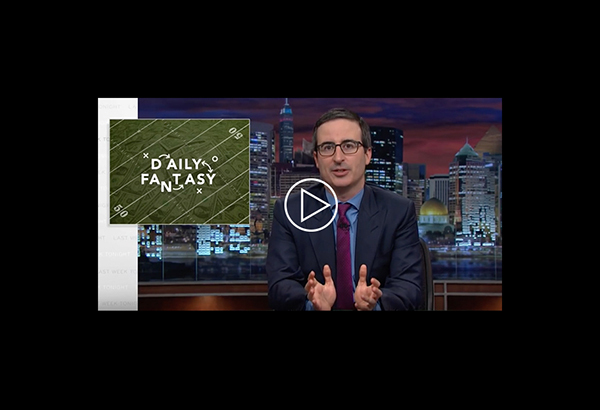 John Oliver breaks down the many, many issues surrounding Commercial Fantasy Sports national attempt to legalize online gambling. Copyright © 2016 Arizona Indian Gaming Association. All rights reserved.